Former Canyons members find substance in new band. Wednesday, June 7, 8 p.m. Hearing that Canyons broke up late last year sucked. They'd completed two stellar EPs in a relatively short time, and these releases foreshadowed a brilliant full-length. Then, hope: Singer-guitarists Kate Anderson and Secily Saunders announced they'd continue to make music together in a new band, Winter Grain, as well as in marriage. Even better was the news that three of the five tracks on the new band's debut EP are Canyons songs. But it makes you wonder if this is just Canyons continuing under a new name. Seated on a small sofa in their Sugar House home, Anderson and Saunders say that's not necessarily so. They knew, post-Canyons, that they'd continue to write and play together. They were torn, however, over whether to start from scratch or re-record old songs. On one hand, a new band is a new band—and a fresh start. On the other, why let perfectly good songs die? Ultimately, they sent several tracks to producer Ryan Hadlock, including Canyons' recordings. "We sent a bunch of demos," Saunders says, "and he just happened to pick these songs." They decided to trust him—since he knows things, having worked with the likes of Foo Fighters, The Lumineers, Vance Joy and Brandi Carlile at his family's Bear Creek Studios near Seattle. What's more, Hadlock chose "The Fare," "Don't Force It" and "Solitary Trees"—recordings Saunders says were "just demo quality, anyway." Now, they just had to put together a band. "Up until a week-and-a-half before we went, we didn't know who was going up with us," Saunders says. Canyons formed somewhat spontaneously around Anderson and her songs, and Winter Grain came together similarly, as Saunders sees the new band as Anderson's project, with her attached. 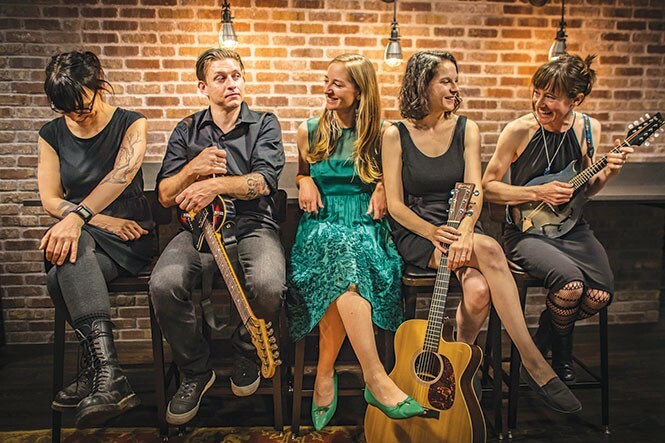 Guitarist Tim Neu (an original member of Canyons), cellist Melissa Collins and fiddle/mandolin player Tara Shupe all agreed to join for the recording. Afterward, Saunders says, "we realized we wanted to be a band." At first taking the palindromic tag Wolf & floW, they soon discovered the name was taken. Anderson asked everyone in the band to make suggestions, with the directive that the name "incorporate something that hits on a personal level." Collins, who works for Summerhays Music as a luthier, suggested a woodworking term. "When a tree experiences a harsh winter, it pulls its sap and nutrients into the ground for survival, and it doesn't grow as fast," Anderson says. "So, when you cut down a tree, the darker grains are the winter grains, and the lighter, the spring." It's kinda perfect, she continues, "having been through a harder winter—for everybody." Saunders runs down the list of the band members' life events: "Becoming a parent, two new houses purchased, a breakup, a breakup, a breakup." At the same time, Anderson, a helicopter pilot with the Utah Air National Guard, had an opportunity to train on the legendary Black Hawk chopper, which took her to Arizona until just over a week before Winter Grain would leave for Seattle. That meant the band rehearsed only twice and played two low-key private parties before tracking the EP. Canyons' so-called demos sounded great, very much like a band, but Hadlock's pro touch and constructive criticism, along with the new players and instrumentation, make a big difference in Winter Grain's versions. With polish, the tunes gain sharper focus, but lose a touch of grit—not much, though, considering the pace of the events leading up to recording. The clean production suits Anderson's clear-eyed lyrics and the group's honeyed harmonies. There is no wasted space, and the players serve the songs. The two new tracks—a smokin' country number called "Breaking Glass" and sublime ballad called "The Wall"—fit nicely among their older siblings. The EP is a fitting bow for a new band that came together out of hardship and stress, only to find an easy and real connection over five days in a secluded former barn. You can see how they became a unit throughout the experience, but also why. When you achieve this sort of alchemy, under these circumstances, with history but also a sense of renewal, you don't force it—just let it ride. Then again, there is one thing Winter Grain does want to control: how you hear the music. Instead of booking their first real gig for their album release, they went outside the box. Hoping to eliminate distractions and encourage focus, Saunders looked into renting Clark Planetarium for the band's own Pink Floyd-style laser light party. She was pleasantly surprised when they agreed. "They've never done it before," she says, "so they're just as nerdy-stoked as we are." It's a new combination, for sure, but also kinda perfect. "Lasers and folk music," Saunders muses. "That's everybody's dream, right?"